The tech of the future is here, and it’s called GIS. Geographic information systems were developed for quick and easy access to information in situations when data was difficult to portray outside of a 3D representation, and mobility was a prime factor. When combined with the tablets (rugged tablets and GNSS tablets), the functionality of GIS exploded, and now the technology is used across a dizzying number of verticals and industries. Currently, most of the GIS software is designed for Windows operating systems, removing the worry about security with Android, and its integration with Windows based tablets has opened up a whole new level of efficacy for workflow mobility. Instead of simple data acquisition, GIS applications implemented on a Windows OS simplify complex data analysis and can centralize disparate map collections. Business planning can be taken beyond basic engineering, and lend new vision and breadth to logistical modeling. The result is a proactive approach to asset management. While GIS is gradually available on certain consumer grade tablets, upgrading to a rugged tablet saves considerable costs down the road when it comes to updates and replacements. 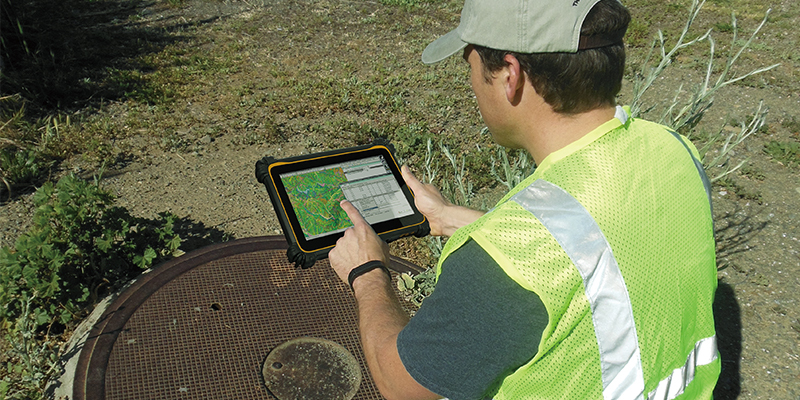 Rugged tablets and GIS can work together to capture critical data and allow access from various mobile points in critical situations or unfavorable conditions. Data capture modules, extreme mobility, and superior durability are key benefits of choosing rugged tablets over consumer grade models. GIS applications used by service personnel in inclement weather conditions or hazardous environments need to be embedded in devices that can stand up to the strain. Consumer grade tablets simply aren’t built to withstand the kind of repeated cold, heat, and shock of dropping / falling. The built-in highly accurate positioning engine is also an advantage to a rugged tablet. It provides up to centimeter-grade positioning while the other tablets only offer meter-grade positioning. The ability to connect to other peripheral equipment is also vital, and rugged tablets can offer True Serial Port or RJ45 I/O connectivity for diagnostic testing and other tasks. GIS data can be specifically useful in the field in situations that include spread of a vector, tactical response execution, land and water resource tracking and management, and utility infrastructure expansion, to name just a few. 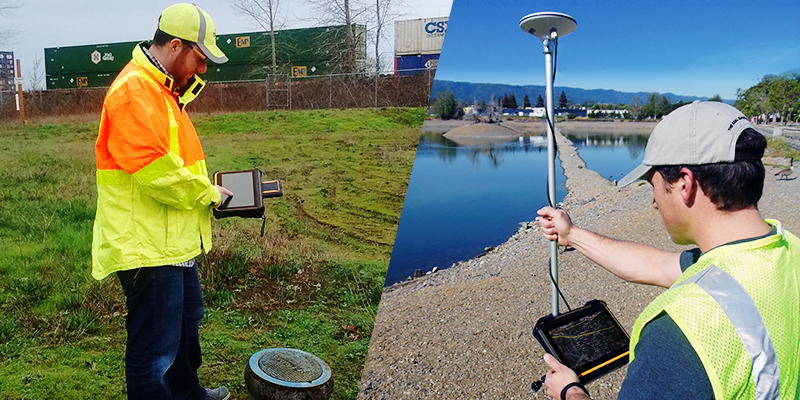 Rugged tablets and GNSS tablets provide data access, analysis, continuity, and solution scalability that supports meaningful implementation of GIS functionality. Most mobile PC manufacturers simply don’t ensure compliance with GIS standards or compatibility with GIS software. Rugged tablets and GNSS tablets make sure the hardware and software sync correctly for a device that more than proves its usefulness – giving mobile data access another much needed boost. 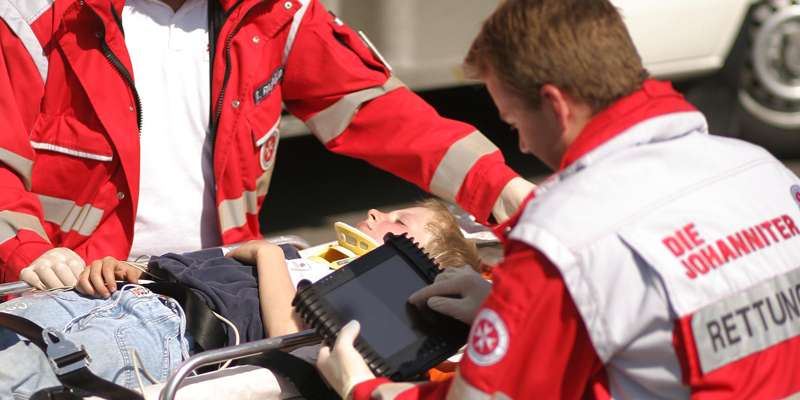 Are Rugged Tablets Suitable for Public Safety Implementation? The potential for rugged tablet implementation and success is nowhere more apparent than in the sector of Public Safety. The sheer range of possibilities when it comes to engaging the power of mobile tech for public safety stretches across agencies and provides an untapped wealth of marketability for devices that match durability with computing power. Tablets can deliver data fast, helping to diffuse tense situations and clarify issues. They can be used to record if needed, to take field interviews, to access records, and even to verify insurance or issue tickets or warnings. The connectivity and authentication measures available means that data can be transmitted securely. Rugged tablets can be invaluable for in the field investigations, necessary photos, and personnel deployment and tracking. Durability, dust and water resistance make the tablet a perfect device for use in harsh conditions. Evidence and cataloguing in emergent situations provides a records trail for later scrutiny. Fast, reliable records access and medical information via approved and authorized journals and apps make EMT workers feel more confident. They can benefit from real time data transmission, cross referencing drug interactions and accessing past medical records, and can even video call their counterparts at the hospital for quick telemedical intervention. Lifesaving procedures can even be refreshed on the spot for accurate application. GPS and GIS capability ensures that markers can be verified for correct positioning and that location stamping is recorded. Photo capability adds visuals to records and inspection reports. Form access saves time and extra trips and date lookup apps and code scanners allow for swift checks for safety and viability, while eliminating errors and duplications. Rugged tablets are safe, secure and reliable, allowing users to take advantage of easy input and one-hand operation, versatility and durability, data transfer and access, security protocol adherence, and more. Find out what rugged tablets can bring to public safety in your associated field and start implementing these must have tools today. What Can Rugged Tablets Do for the Public Sector? As cities and communities continue to grow, the need for technology and innovation that keeps pace is crucial. 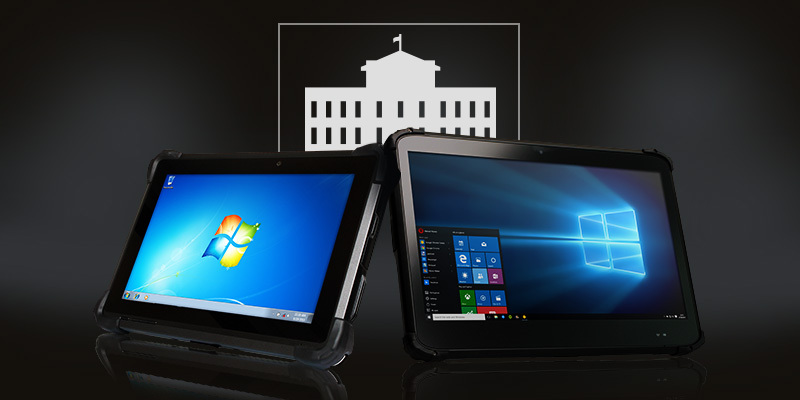 The public sector requires tools, software, and devices that meet this need, and rugged tablets fit the bill. The design and operation of city and county services can be enhanced in many ways by mobile tech, and the public sector can benefit hugely by getting on board sooner rather than later; embracing the potential that mobile tech offers. Rugged tablets provide a fundamental, adaptive, and obsolescence-resistant mobile computing platform which can provide long-term investment protection for government agency initiatives. 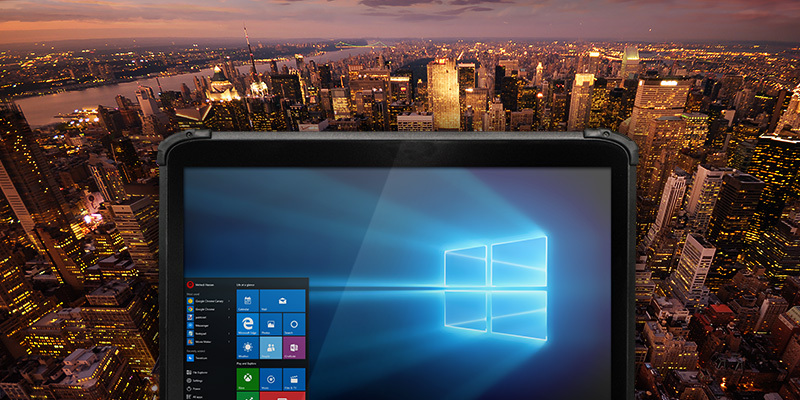 They also provide a low CAPEX and render a higher ROI than any other mobile PC solution, including smartphones and laptops or notebook PCs. Data collection, storage, transfer, collation, and access is streamlined with mobile tech – providing a fast, cost effective way to manage projects and avoid false starts, lapses in oversight, cost overruns, repeated delays, and obstacles due to aging infrastructure. With a rugged tablet, you get multiple functionality on one device, which is ultimately cost effective. There’s no need for separate devices to embody each peripheral – no need for a separate camera, barcode scanner, GPS device, mag stripe reader, or monitor. A keyboard or mouse to be connected to the mobile PC via USB or other plug-in becomes redundant and obsolete. The lower TCO is attractive on every level. With the latest in compatible software and built with an eye to low turnover across the next 5-10 years, rugged tablets are designed to be updatable, removing the need for constant upgrades. When combined with the built in durability, this feature lowers the costs of replacement over time, as devices can be used for the long run. The savings over traditional wire systems are obvious – a one time network installation provides a wireless option that every device can tap into instantly without the need for physical wiring or the upkeep that aging wired services require. The same closed network offers a higher level of security, with wireless encryption that cannot be hacked through traditional wired access points. All of these features are reasons why federal, state, and municipality organizations across the nation are well advised to invest in rugged tablets to support today’s and tomorrow’s projects. Security. With closed networks, rugged tablets are some of the most secure devices available to those who require high levels of security to operate. The ability to install security measures for both manual access and potential wireless hacking are a large part of why tablets are overtaking smartphones as the secure device of choice. Card access, pin codes, and even biometrics can be utilized to enhance appropriate accessibility on the fly. Smarter Processes. The software options available for rugged tablets make them the best choice for those on the move, and the accessibility measures make them the right device for situations in which constant handoff is required. Platforms are constantly being revisited and manufacturers work in tandem with the most used operating system creators. Real Time Access. When data is required in the field, sooner is better than later. The ability to transfer or enable access to data immediately and share updates and changes makes the rugged tablet even more valuable from a time saving and productivity standpoint. Data Capture Capability. Data entry in the field is fast and easy with a virtual keyboard, a stylus, a scanner or a built in code recognition system. ReduceNo errors by using fully built in data capture rather than transferring data between various separate scanners and readers or less reliable snap-on toolson paperwork, and records can quickly be checked and matched with offsite inventory counts. Compatibility. The ability to work between old tech and new, easing the transition between outdated PCs and smartphones, while bringing new innovation and tech to life in their field is another major attraction for those now trialing rugged tablets – it’s the bridge device that was needed to connect office workers and field workers on common ground. Ease of Integration. Finally, rugged tablets are already proven to integrate seamlessly into almost any environment, enabling real-time data access and management as well as business intelligence analytics. Add in fully responsive records management, and rapid, informed decision making capabilities for every individual on the team – regardless of whether they are on foot, on a forklift, in a vehicle, or behind a desk – and you have the ideal computing and data capture device that most managers dream of. Any government organization’s basic process can benefit from the support that rugged tablets and other mobile technologies can drive progress and improve productivity. It’s the smart, strategic decision, with a reasonable CAPEX and a solid ROI.